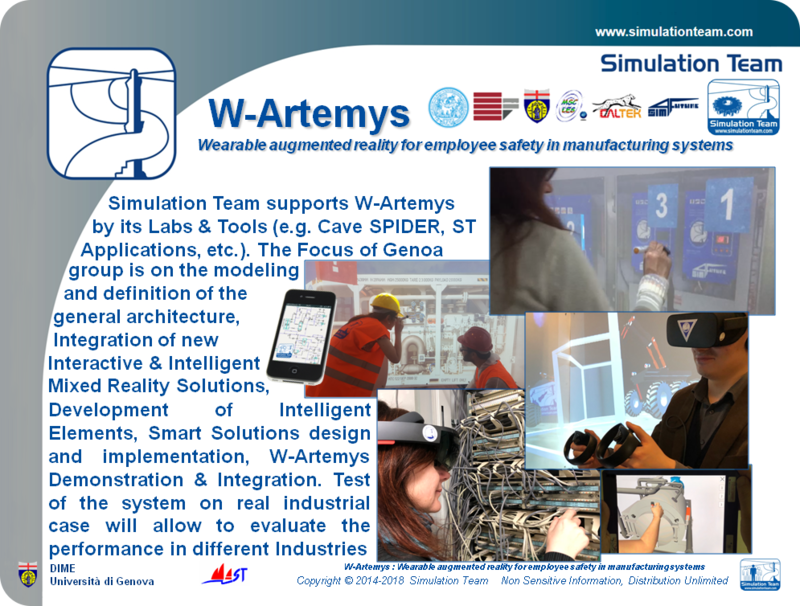 The main goal of W-Artemys project is to develop wearable solutions using Mixed Reality (Virtual Reality and Augmented Reality) to improve safety, productivity and efficiency of Industrial Plants. W-Artemys supports integration of data collected on the production plant by different automation systems with MR (VR & AR) to support Production Line Supervision, Service, Plant Fine Tuning, etc. Simulation Team supports W-Artemys by its Labs & Tools (e.g. Cave SPIDER, ST Applications, etc.). The Focus of Genoa group is on the modeling and definition of the general architecture, Integration of new Interactive & Intelligent Mixed Reality Solutions, Development of Intelligent Elements, Smart Solutions design and implementation, W-Artemys Demonstration & Integration. Test of the system on real industrial case will allow to evaluate the performance in different Industries This project support Simulation Team activities in development of Innovative Solutions for Maintenance and Service.